Having been part of the “Women’s Studies” course at Bangor University, I developed a serious interest in the part that women have played in history and their achievements, which led to my becoming involved with the AMC/WAW. I feel the achievements and work carried out by women have been largely ignored and, as well as researching our lost history , there is a need to record the more recent past, including the lives of “ordinary” women, as well as more famous ones. 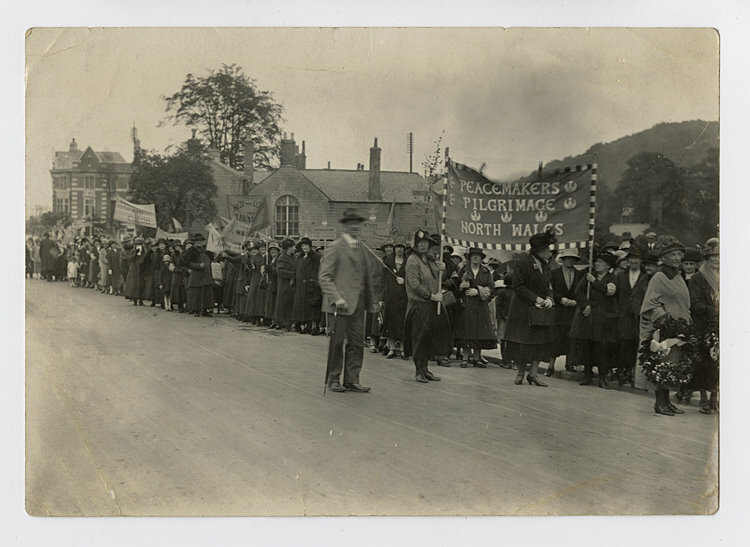 I have chosen this image, not only because I have great respect for those who took part from North Wales, but because “Cymru DrosHeddwch/Wales for Peace” are still carrying on the ideals and intentions of the original people who marched in 1926, which is so important in the worrying times in which we now live.